John C. Chaney, M.D., FCCP is board-certified by the American Board of Internal Medicine with sub-specialty certifications in Pulmonary Disease, Critical Care Medicine and Sleep Medicine. Prior to joining White-Wilson Medical Center in 2008, Dr. Chaney served in the United States Air Force as a Pulmonologist at Lackland Air Force Base in Texas. Dr. Chaney received his medical doctor degree from the University of Texas School of Medicine in San Antonio, TX. Upon graduating he went on to complete his internship, residency and fellowship at the Wilford Hall Medical Center in San Antonio, TX. 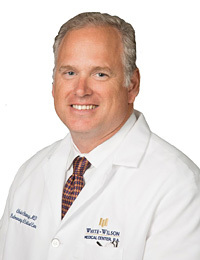 Dr. Chaney specializes in Pulmonary Medicine, Critical Care Medicine and Sleep Medicine at the White-Wilson Pulmonology Clinic in Fort Walton Beach, and is one of the most sought after pulmonologists in the region. Dr. Chaney performs services to include lung biopsies, sleep studies and pulmonary function testing. In addition, Dr. Chaney performs a new outpatient procedure, Bronchial Thermoplasty, for severe asthmatic patients who continue to be symptomatic despite the use of medications.